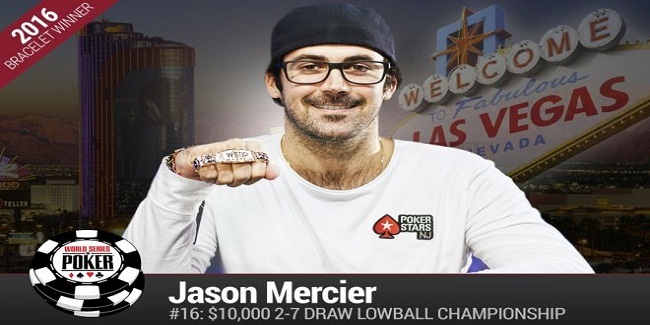 Jason Mercier, a Florida based pro poker player won his fourth gold bracelet of World Series of poker. This was the event#16 of the WSOP 2016 to which the American player did great at the end of the game. The event was $10K Deuce to seven Lowball championship, which attracted 100 entrants and generated a cash pool prize of amount $940,000. Top 15 players/places of the event got away with some amount of cash, with Canadian Mike Watson finishes for second place with total winning share of amount $168,936. Now all time money for this player at WSOP is increased to $3,865,142, which includes 16 final table appearances and 4 titles wins. No Limit Deuce to seven Lowball game is known as the “purest form of poker” and it was Mercier who proved that he the champion of the game. Mercier is the 39th player in the history of the game who has won four World Series of poker gold bracelet, which really seems to be a great job by him. He was very pleased and said that ‘If I can win gold here, it will be a sick sweat the rest of the series”. Mercier won this championship title in the presence a few WSOP title winners and they were Benny Glaser, David Grey, and Jesse Martin. 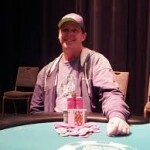 The Canadian Mike Watson was the runner up of the event with total winning share of amount $168,936. One having good chip lead over players but could not be able to pass through to the line. The third position of the game was for an American Lamar Wilkinson, who collected $120,025. He had a couple of good cashes at previous WSOP series. Fourth, fifth and sixth places were for David Grey ($86,302), Benny Glaser, from Southampton, United Kingdom($62,810) and Stephen Chadwick, another UK based poker player who earned $46,277 from the game. Meanwhile seventh, eighth and ninth positions belongs to players from Alex Luneau of peris ($34,522), Herezel Zalewski($26,078), and Jesse Martin, the winner of 2013 gold bracelet, who collected $19,953 as winning prize.